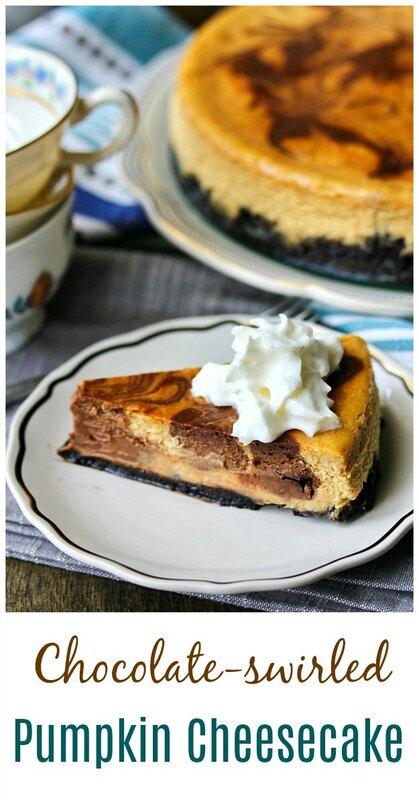 This chocolate-swirled pumpkin cheesecake is deeply flavored with both chocolate and pumpkin, and may just make your pumpkin pie very jealous. 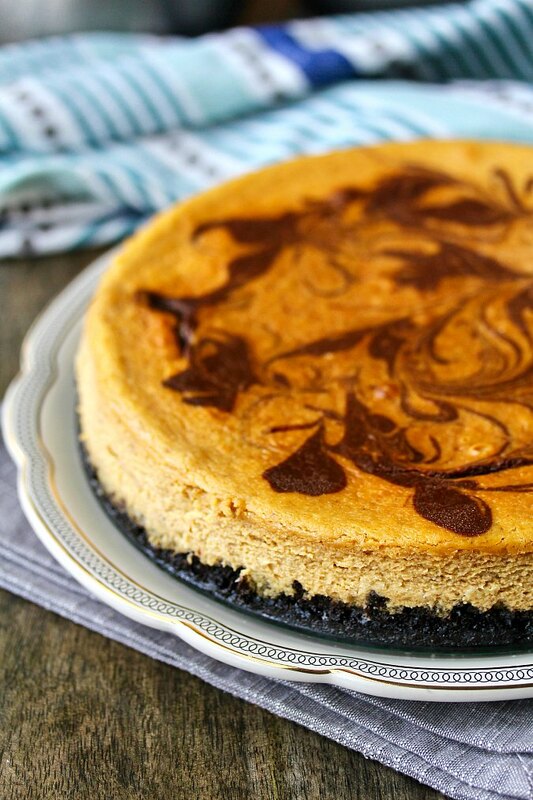 I love the swirls of chocolate cheesecake that are incorporated in this pumpkin cheesecake. They look pretty fancy, but are actually pretty easy. If you know cursive, you should be able to easily pull this off. 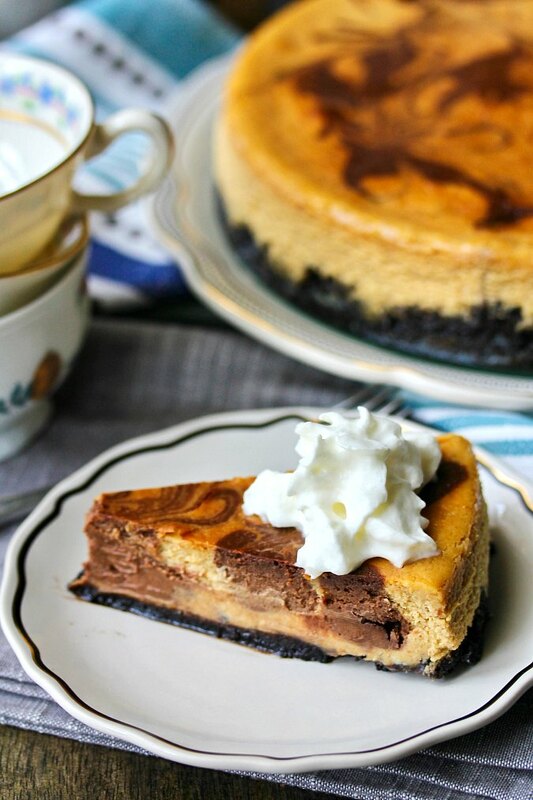 I'm so excited about this pumpkin and chocolate cheesecake! The marbling design is made by dolloping the chocolate cheesecake mixture into the pumpkin cheesecake, and drawing a cursive capital "L" with a toothpick throughout the pan to drag the chocolate throughout the pumpkin part. Easy, right? The pumpkin and chocolate go so well together too. Just ask my taste testers! After the chocolate-swirled pumpkin cheesecake recipe, be sure to check out the rest of the Pumpkin Week participants' recipes, and check out the prizes you can win from our sponsors. Pulse the sugar and cookies in the food processor until finely ground. Add the butter and pulse until combined. Press the crumbs into a 9 inch springform pan. You can use a flat bottomed glass to press the crumbs in firmly. Bake for 8 to 10 minutes, until firm. Cool on a wire rack. Move the oven rack to the bottom third, and leave the oven on. 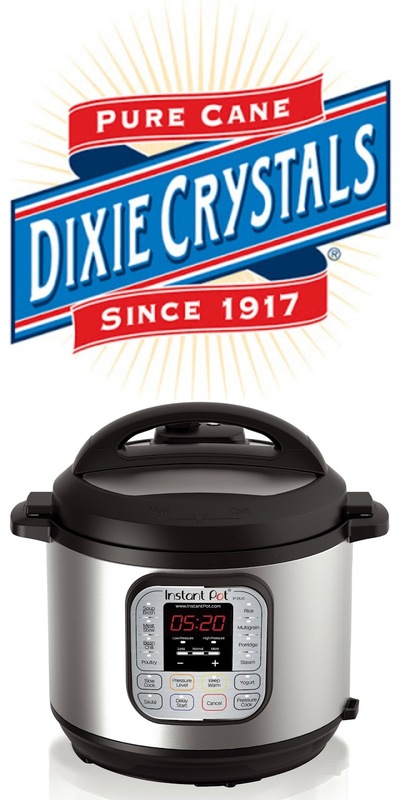 Once the crust has cooled, double wrap the bottom and up the sides of the springform pan with two layers of heavy duty foil. This is to prevent water from leaking into the pan. Place the wrapped pan into a larger baking pan. I used an 18 inch by 13 inch sheet cake pan. In a stand mixer, using the paddle attachment, beat the cream cheese on medium for about 1 minute, until smooth. Beat in the sugar until just combined. Add the pumpkin, cinnamon, nutmeg, coves, and vanilla and mix until smooth. Add the eggs, egg yolk, and 1 1/4 cups of the cream until just combined. In a small saucepan, heat the rest of the cream to simmering. Remove from the heat and add the chopped chocolate. Let sit for two minutes. Whisk until smooth. Add 1 cup of the cheesecake batter, and whisk until smooth. Add the rest of the batter to the prepared springform pan. Dollop (2 tablespoons at a time) the chocolate cheesecake mixture evenly over the top of the batter in the pan. Use a toothpick to draw a capital "L" in cursive throughout the batter, turning the pan as you work through each section. Pour an inch of boiling water into the baking pan (not the springform pan) and place the pans in the oven. Bake for 1 hour and 15 minutes, to 1 hour and 25 minutes, until only the center of the cake is jiggly. Turn off the oven but leave the cake in the oven with the door ajar, for 45 minutes more. Remove the pan from the oven and the water bath. Remove the foil, and run a thin knife around the edge of the cake Cool completely on a wire rack, about 2 to 3 hours. Cover with plastic wrap and refrigerate for 8 to 24 hours before serving. Welcome to #PumpkinWeek 2018 hosted by Love and Confections and A Kitchen Hoor's Adventures! 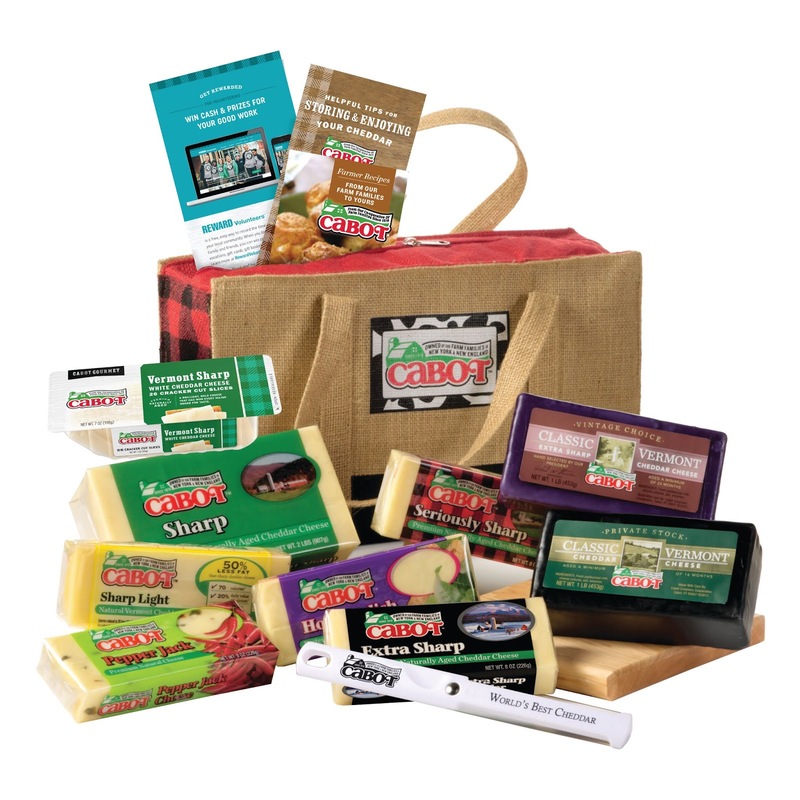 This year is even bigger and better than ever with a giveaway! Thirty nine bloggers from around the country are showcasing their best pumpkin dishes. Get ready for Fall with over 130 pumpkin recipes throughout the week including cocktails, main courses, pizzas, pastas, pastries, breads, muffins, and plenty of desserts! Well, of course, Karen you knocked it out of the park again! Can you read my mind, Karen? Thanks so much to the maker of beautiful opera cakes! This was pretty easy and forgiving. nah.... you are just being your modest self... I know that! Absolutely lovely pumpkin cheesecake looks fantastic Karen oh and did the winners come out yet because I don't know how this works and thank you. This is a new contest. The other one hasn't closed yet. Two chances! Aside from pumpkin pie, I like pumpkin bread. Just like with muffins, it is great warmed up with melted butter on it. Holy delicious! I can only begin to imagine how wonderful this pumpkin cheesecake has to take. The chocolate swirl really takes this pumpkin recipe over the top! Congrats on such a stellar recipe! I love to put roasted, pureed, and drained pumpkin in my cereal (cold or warm) with cinnamon and cayenne. I also love to cook it diced and put in frittatas. I usually put the pumpkin liquid in my sourdough bread - which gives it a wonderful sweet crumb. That sounds really good! I also have one recipe here for sourdough with a bit of pumpkin in it! I'm sure there are countless recipes that utilize pumpkin and I've tried my fair share but I still come back to my all time favorite, a simple, delicious pumpkin pie. I eat a piece every morning after Thanksgiving for breakfast. It's one of the best things I eat all year.